I should laugh silently; my soul is serene. There is another heaven and earth beyond the world of men. I live in the suburbs in a mild climate. The average low in winter is only 13 degrees cooler than in summer. I drive on fully paved roads. I walk on fully paved sidewalks. The water I drink comes from faucets. The food I eat comes from supermarkets, wrapped in plastic and cardboard. Every tree I see has been deliberately planted there. The only wild animals I ever see, aside from ants and birds and squirrels, appear to me only on TV screens and computer monitors. If people around me get sick, they simply disappear into hospitals. I don’t have to deal with it. 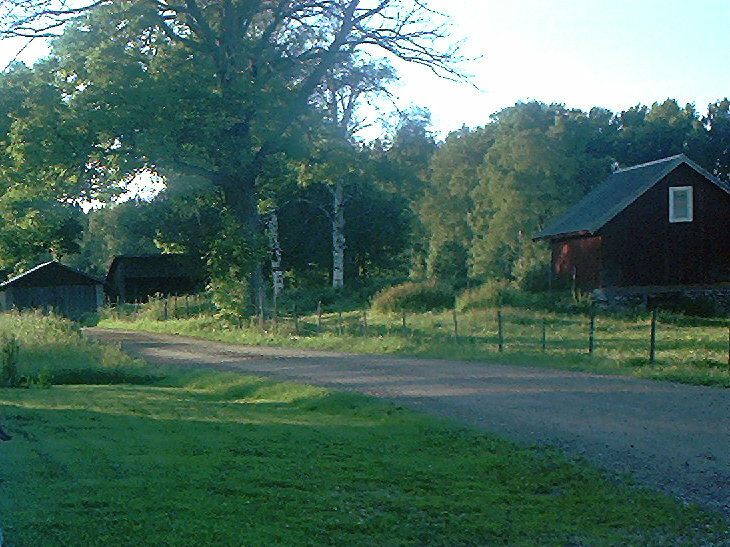 When I leave my suburban environment to visit my cousins who live in the Swedish countryside, I am also struck how antiseptic my life seems in comparison. Over there, we drive on dirt roads carved out of dense forests. We drink unprocessed milk, and eat potatoes freshly dug out of the ground. Summer bursts forth in June and vanishes in August, and while it lasts, the greens are more green, the reds are more red, the blues are more blue. We breathe a fresh summer air that is palpably different from the air of California. This air is not a year-round air; it smells of the intensity of life that knows its time is brief. The smell of a Swedish summer–I cannot capture it, or pass it on to anyone else who has not been there and smelled it themselves. It exists only in its own place, in its own moment. All this beauty is fleeting, and its temporary status makes it even more beautiful. Is taking a photo or video of an event for later viewing worth it, even if it means more or less missing the event in realtime? What’s better, a lifetime of mediated viewing of my son’s first steps or a one-time in-person viewing? I haven’t blogged in over a week. I’ve been sick, and then when I got better, I had to catch up on the things I missed that were higher priority than my blogging. Things happened during this week, and I experienced them, but did not record my thoughts about them. The offensive explosions in the two games the A’s won against the Angels, the narrow losses, the brilliant pitching performance of Greg Smith in that 1968 turn-back-the-clock uniform–does it matter if I forget them tomorrow if I enjoyed experiencing them today? Jamie Wright pitched and helped beat the A’s on Saturday night. I’ll always root for him, because many years ago I went with my family one cold night to a sparsely attended AAA game, and ended up with front-row seats behind the bullpen. Wright was out there, and chatted with and charmed my two young kids for a long time. I wish I could remember what he did or what was said, but I wasn’t blogging back then, and I don’t have a photograph. All I have now is a fuzzy impression in my mind, that Jamie Wright is a nice guy. A week ago Friday: my stomach had been queasy all day. I warned my teammates I might have to abandon them mid-game, and run to the bathroom. Fortunately, though, my stomach behaved for that one hour, and I went out and played my best indoor soccer game in months. Our rec league has maximum three-goals-per-player rule, and I hit my max fairly early in the second half. "I should have stomach problems more often," I joked. I had hurt my back in December, and it took over a month to heal. Even after the pain receded, my old soccer skills continued to elude me. I am 42 now, and had started to wonder if this recent loss of quickness and agility was now permanent. But after this three-goal outburst, I headed home feeling young and healthy once again. I looked forward to checking out my stats online, and seeing my name return atop the league scoring leader boards, where they used to be regularly when I was younger and faster. Stomach problems or no, I arrived home feeling great. By the following Monday, I wasn’t feeling so great anymore. Those stomach problems turned into a stomach flu, and I spent the whole week lying in bed, with no energy whatsoever. So much for being young and healthy. While lying in bed feeling sorry for myself, I got an email telling me that another player in the same indoor soccer leagues, just one year older than me, had left the same field that same Friday night, but never made it home. Heart attack while driving. The flu? I’m the lucky one. And the leaf would be carried down the river. In between that Friday when I scored the three goals, and the Monday when I fell ill, I spent the weekend volunteering for Circus for Arts in the Schools. This is a performance of professional circus artists from Cirque du Soleil and Pickle Family Circus, among others, to raise money for arts education in elementary schools. My wife is one of the producers of the show. My volunteer efforts in this case meant mostly that I took care of my 10-month-old daughter between nursings, so that my wife could get things done. At one point during rehersals, I was holding my daughters hands as she walked around backstage (she can’t quite walk on her own yet). She went up to the trio of young ladies in the contortionist act, and proceeded to charm their socks off. Smiling, laughing, saying "hi", sharing her Cheerios–the contortionists were absolutely mesmerized by my charming little toddler. "She’s the cutest baby I’ve ever seen!" one of them exclaimed. They called over the hoop divers, the jugglers and the acrobats. "Check out my new friend! Isn’t she amazing?" The irony was not lost on me. Here were people who could put their chins on the floor and touch their noses with their feet, people who could do double backflips through a small hoop six feet in the air, people who can do a handstand on top of someone else’s head, people who could juggle balls behind their backs blindfolded, and they were being thoroughly entertained by someone who can barely take a step on her own without falling over. It was a delicious moment. I wish I had a picture. I’ll have to settle for this blog entry. These circus performers are amazing athletes, every bit as impressive to me as a major-league baseball player, or an NFL star, or a slam-dunk champion. But their every move isn’t broadcast on ESPN, their every success and failure isn’t measured by Stats, Inc., and their delicious off-stage moments aren’t discussed and dissected by snarky commenters on Deadspin. I remember getting a backstage tour at a Cirque du Soleil once, and there was one tent almost exclusively dedicated to training and medical facilities. And yet, there’s no Will Carroll reporting on which acrobats will miss tonight’s show with a sprained ankle or an injured back. Circus performers and circus audiences, like 99.9% of the rest of mankind, are left after each performance with only hazy memories, mere shadows of the undocumented real events of our lives. While there is unquestionably a new media revolution going on, and much of it is good, the part — speaking for myself, the only part, the ONLY part — of which I am critical, is that there is an ethos on a significant portion of the web, an ethos not of criticism or skepticism or a contrarian viewpoint. There is an ethos of abuse, where not only is cogent thought not required, it’s almost resented. Where a reasonable argument has no place and where ad hominem attacks reign. It seems to me that the question Jason Kottke asks is also at the core of this whole Costas-Bissinger-Leitch blowup. The relentless snark that many bloggers and commenters direct at the mainstream media is, in my opinion, a direct response to the distorted values that the MSM shoves down our throats day after day: that fame, above all else, is the most important of all human values. Britney Spears and Lindsey Lohan and Paris Hilton as Time’s People of the Year? You can make a serious argument for it. This ethos of abuse is directed primarily at those people who make their fortunes exploiting and distributing and peddling and shrink-wrapping Fame for commercial use. Because if Fame is truly the ideal, all of us who fail to achieve it, all of us who fail to have our every move documented and distributed across the globe, are leading worthless lives. And if it isn’t the ideal, then all the stuff the MSM feeds us about the lives of famous people is nothing but humbug. In either case, it’s not surprising then they get bitter, they cling to snark or abuse or antipathy toward people who aren’t obscure like them or anti-celebrity sentiment or anti-media sentiment, "uttering cries that are almost human" as a way to explain their frustrations. It’s an easy cycle to fall into, but it’s inauthentic. It’s like a shark digesting a shoe. It fills the stomach, but provides no nourishment. No human problem gets solved, no human soul gets touched. Beyond the world of men, beyond the false ideal of fame, authentically beautiful life experiences move like peach blossoms in a stream, leaving nothing but shadows in its wake. 2. Ken Arneson is the first person I’m aware of who has elevated blogging to an art. Beyond the obvious beauty and merits of Ken’s post, it unlocked a door in my mind that revealed that the issue with Bissinger and Costas’s criticisms is that they’re confusing the medium with the message. I still wish Costas had someone like Ken on that panel. 4. 3 Yeah, the Daily Show, with Jon Stewart. 5. Man, that was good. I usually lurk around the toaster and I’ve been doing it for awhile. I just wanna say thank you. You don’t always get a lot of comments so I just wanted to say that I check practically everyday to see if you’ve written something. Thanks, that was worth the wait. 6. 3 4 Bill Moyers, Bill Moyers Journal. Thanks for the great read, Ken. 7. New potatoes with butter and bit of feta cheese are sublime. Thank you for stoking my memory. 8. Actually, I did. The CdS performers are truly athletes and have their own Athletic Trainers. CdS has a full medical setup in Vegas, just off the strip, that puts most team sites to shame as well as a full setup in Montreal. I did an interview with the Vegas director of medical services, who had some amazing stories about oddball injuries. You can only imagine the muscle strains and that’s without discussing Zumanity! It’s something I should revisit. Great post.